My little sister inspired me to buy pyramid studs and get crafty! She posted a picture on Instagram of her DIY studded denim button up, which inspired me to stud something of my own - TOMS! I have too many pairs of TOMS, so I thought it would be fun to do something different to one of my pairs. 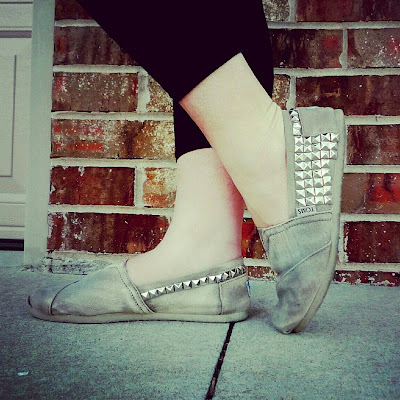 I took my gray denim TOMS and bought pyramid studs at Walmart and went to work! Now, I'm not going to lie...trying to find studs took me on an adventure! I tried Hobby Lobby and Michael's first, but they were sold out! I ended up buying "studded ribbon" at Walmart and just took the studs off and stuck them on my TOMS! About 100 pyramid studs and an hour and a half later, I completed my DIY studded TOMS project! Definitely think they are cute!